Get Well Gabby | Where is my Manual? When your first baby was born, you probably read every book out there on how to be the best parent and what to expect from this baby. I remember having the book What to Expect When You Are Expecting and the books that followed in that series. I would follow along with them through my pregnancy and through the life of my new baby. Madison was my first-born. She was a little difficult during the first month or so of life. She would not sleep!!! I can remember looking everywhere in this book for answers as to what I should do with her. When the book didn’t work, I turned to friends with children. I didn’t have many at the time since I was the first of some of my friends and relatives to have a child. When that didn’t work, I called my mom and asked for her advice. I don’t really remember taking any specific advice on what to do, I think John and I just did what we had to do and hoped it would work and that we weren’t going to “screw” up our baby. Madison was breastfed. She would eat every 2 hours, the problem was, she was not a very proficient eater. It would take her an hour to eat and left her an hour to sleep before wanting to eat again. John would take turns with me at night. I would feed Madison for an hour and hand her over to John. He would sleep with Madison on the couch until she woke up hungry again (another hour later) and give her back to me. Needless to say, we didn’t sleep much at all!!! I don’t know when it finally clicked, but at some point she started going longer stretches of time and we could finally sleep for more than an hour at a time. There are some things you can’t learn from a book. This was one of them. I know there were many more times that myself or my friends had questions regarding something that happened to their baby and what should they do. There isn’t a chapter in the book that explains everything to you in detail. Some things you just have to figure out for yourself and hope you are doing the right thing. 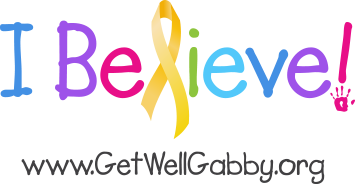 Gabby was diagnosed with brain cancer. We started doing some research on the particular kind of cancer she was diagnosed with and consulted our Oncologist. We were told by her and some other people, stop researching this; the news you will read is only going to be more devastating. How do you help yourself or your child when you are told not to read about what she was diagnosed with? At the hospital we were assigned a social worker. He came to visit us in our room and handed me a “goody bag” for lack of any other term. In this bag was a book regarding brain tumors, a scrapbook with Happy Birthday and Congratulations stickers, a disposable camera, and a few other things that aren’t very memorable. He handed me a few meal voucher coupons and told me to let him know if I needed anything. This was our support! Really??? I told him the thing I needed the most was to be able to talk to someone that had been through this before or was going through it now. I needed to understand what we were dealing with. I needed to know what to expect at the hospital, what to expect from Gabby, how we were suppose to manage everything. I was told because of HIPA, he could not give me that information but I could talk to people in the halls on the Oncology floor. That wasn’t much help since a lot of the people there were walking around with their heads down and in a daze themselves over what they were dealing with regarding their own child. We were able to make some connections with some families, but none that had the same diagnosis or the same treatment options. We were still very much on our own. We had to decide what was best for Gabby and our family. We had to figure out how to cope with all of our emotions and feelings and scary thoughts without the help of anyone else. When Gabby was in a coma in the hospital, it all happened so fast, there was no consulting a book or anyone else to help us figure out what to do for ourselves or for Madison and Katie. We didn’t have a parent we could ask; ours had never been through this before. We did what we thought was best and sat down with them and were very honest about what was happening and what could happen. That was the day that we told the girls there was a chance that Gabby was going to go live in heaven. The alternative was that she would wake up from this special sleep she was in. Katie and Madison came into the room and sat on the bed begging Gabby to wake up every day until the day we decided to bring her home. Again, another time that we didn’t have any reference. We did what we wanted as a family. We talked to Madison and Katie and again explained the situation. We asked if they wanted Gabby to stay at the hospital or did they want their sister at home in their house with their things. The decision was unanimous that we were bringing Gabby home to be with all of us at our house. They knew at this point she was not going to wake up but we still didn’t give up BELIEVING a miracle could happen. Gabby went to heaven and we were there by her side. Again, we didn’t actually believe it was really going to happen and we didn’t know what to do when it did. Obviously we had made the proper arrangements for her even through it was gut wrenching making those calls. We didn’t know how to act, how to act towards the kids, how to help the kids to understand, etc. Gabbys story was on Facebook, and we got plenty of response from people telling us what we should be saying and doing. My question is how many of them have dealt with this personally or was this just their opinion on how they think it should be handled? Over the next few months we were criticized for many of the decisions we made or the way we were acting. Again, my question, how many of these people that were criticizing us have actually had to deal with a death of a child first hand? It took several months to start reading the self-help books on how to cope with the loss and how to help our children cope with the loss. Again, these books remind me of the baby parenting books. Not all situations are covered; you still have to decide on your own what is best for your situation and how to deal with it on your own. We moved. Several of the books suggest not moving or making any major life changes for at least a year from the loss of your loved one. This was a decision John and I had decided while Gabby was sick in the hospital. We had decided that IF anything did happen to her, we would move from our current house. We talked to the girls and Katie was on board but Madison was not really a fan of moving from her friends. We needed to get away and be on our own. We didn’t want to be the people sitting in the stands watching our daughters play a sport while the crowd was watching to see how we were reacting. We didn’t want to get hugs from strangers at the supermarket anymore. We wanted a place where we could start over and heal at the same time. A place where the girls could make new friends and not have their sister as a shadow over who they are as a person. This is what we thought was best for our family, yet all of the self help books you read tell you not to do it! There have been times since our move that I have regretted it for one reason or another. I am sure all of us feel the same way. I know John felt a strong connection to the room where Gabby went to heaven. I personally could not go in that room of our house after that day. It held bad memories for me and I didn’t want to look in the spot where her bed was. Katie and Madison miss their friends and they talk about the house and the fact that they miss it. I have thought it would have just been easier for support when I have my days or moments to have someone close to call on to help me out with the house work, the girls, etc. I have to remind myself that when I was there, I was getting an overwhelming amount of calls and visits from people that I didn’t really want to visit with at that particular time. I wanted to have my peace and quite and only deal with people when I wanted to deal with them. Another reason I love living where I am now. No one bothers me and if they call and I don’t want to talk, I just don’t pick up the phone. Of course it’s also lonely. Many, many people that I would have considered friends have just walked right out of my life and that really hurts. I have talked to other parents that are dealing with a similar death or even a child that is diagnosed with cancer and they are having the same problems. People they considered friends have just walked out of their life. None of my books talk about why people abandon you when you are so low and dealing with something so tragic. What is it? I can’t be a good friend to them so they decide they don’t have to be my friend anymore? I have a few people that I needed to de-friend off Facebook because they would never comment on anything that I was going through yet they were always complaining or bragging about their own life. I could not hear this. You could not be a supportive person to me at all and now I have to listen to how your child is doing in school or where you took your last vacation. I am not able to help be supportive towards you. I don’t have enough support for myself and my family some days, I definitely don’t have enough to offer some to other people as well. Support Groups and Therapy have not been kind to us either. The books suggest getting involved with a support group. John and I found one in our area for parents that are grieving the loss of a child. We went to one meeting and didn’t ever return. Everyone in that meeting was older than us and had children that were older in age when they passed away. The reasons for passing away were varied; some were drugs, vehicle accidents, suicide, and one with cancer. I think we both perked up when we heard this one parent say that his daughter died from cancer. I think John and I were so desperate to make a connection we were on the edge of our seat to hear their story. The father then started to complain that his daughter owed him $20,000 when she died. This is the story he told, not about how much he missed her, or what they went through with her, that she owed them money. I think it took every ounce of energy in John’s body not to jump out of his seat and punch the guy right in his face. I would pay someone an unlimited amount to get my daughter back! We left that meeting not feeling very connected to anyone. Due to our children’s schedules, it made it difficult to go back again and we would have rather spend the night with Katie and Madison than talk to people we didn’t relate to at all. We have also reached out to therapists. Katie and Madison as currently going to an art therapist once a week and have been for a few months. I was really hoping things would get better for them once starting therapy. I have noticed a decline in Katie’s behavior since we have started it. She seems to be more aggressive verbally towards us, her parents, and Madison. She wants to control EVERYTHING! Again, consulting the self-help books, this is not the norm. The norm is that you take your kids to therapy; they start feeling better about themselves and start acting better. They start wanting to help you more because they understand what we are all dealing with not just their own emotions. Every day becomes a fight in this house over NOTHING! It could be that I ask them to pick up after themselves or that I tell them it’s not an OK day to have a friend over. The books indicate that we are going everything “right” because we are still showing them love, we are still involved in their life, we don’t treat them like they live in their sister’s shadow. We do everything for our girls and it only seems to get worse not better. We have a huge feat to undertake in the next few months. Not only do we have to get through another year of major holidays, but also we have to get ready for a new baby. Our house seems to be in constant disarray and we need to get a handle on it so we can welcome a new baby into our home. Again, another step in life that get’s mixed messages through the self-help books. Some agree that a new baby is just the thing a family needs to continue the healing process. A baby can make the family feel “whole” again. Not to replace the child that has gone to heaven but to bring new life into the house and new joys that aren’t there anymore. Others will say that we should be focusing on the surviving children and should not bring another child into the house until years later. Well, this mamma isn’t getting any younger and if it was going to happen, it needed to happen now or I would be too old to have another baby. We have had our up’s and down’s with this pregnancy as well. When going in for an ultrasound, there was a spot discovered on the baby’s brain. The doctor that came in to talk to us about this was again, not the brightest in dealing with this sensitive family. She brought it up in the ultrasound room in front of Katie and Madison. She read on my chart what had happened to my other daughter but didn’t know exactly what DIPG was or when it gets’s discovered in a child. She needed us to tell her if Gabby was born with this or was it something that developed. She also told us what this spot could mean. It could have been the indication for an extra 18 chromosome. An extra chromosome is fatal to a baby. It could continue to develop in utero and then die within a few days of being born, or it could die inside my belly and either be a still born or I could have a miscarriage late in my pregnancy. This they tell us in front of my children who have just witnessed their little sister go to heaven less than a year ago. Needless to say, we excused the girls from the room and continued to talk about our options to find out what exactly we needed to do regarding further testing. Again, no on here to help us figure out what to do and say to our children that just heard potentially devastating news about their unborn sibling. We opted to do additional blood tests and they came back negative, we also were scheduled for an additional ultrasound to see if the “spot” resolved itself with some growth. It did! We are back to being cleared as having a normal, healthy baby. Again, the emotions around this are too hard to comprehend ourselves and too hard to explain to our children. I guess to sum everything up; there are many things in life that don’t have a manual. You have to learn as you go and make good choices and learn from the bad choices you make. I would love to write a book about our experience with Gabby but who will that benefit? Will it benefit the parents that were just told their child has DIPG and they are in the same state of denial that we were in? Will it benefit the parent who loses their child to cancer and can’t come out of their grief to read about someone else’s grief and how they handled it? Will it help other families to deal with their surviving children and help them cope with the loss of a sibling? Will it help me to put all my raw feelings down on paper so you can see how I really feel about the whole situation? John has been the one that has been very vocal throughout our journey. I have been pretty quite in the background. I am not ready and willing to open up my feelings for the world to hear. I am sure much like John’s feelings, people will be opinionated, and will judge me for what I say. I don’t need that or want that. I just want everyone to know that there is no manual to help you get through this particular phase of our life. There is no book that explains what we should or should not be doing or acting. There is no parent out there in the same situation as ours that feels the same way we do. Everyone feels different and handles things differently. I wish there was a book that I could read and take the advice to make my family feel better and able to handle the world. I wish their was someone I could talk to that would make me realize that I am doing the best I can without judging me or making me second guess everything we have done in the last year plus. I wish that people that claim to be your friend would actually support you and show up when you announce that you are in town doing something to support a good cause. I wish my kids’ friends would actually show up and support them when we are in town as well. I wish this never happened to my family and my precious baby girl. So if you know someone that is going through a rough time, say something to him or her. Even if you don’t know what to say, say something, not nothing. Call before you come over and make sure they really want your company. Don’t do it for you, do it for them. Don’t abandon your friends when they probably need you the most. If you don’t get a call from them, pick up the phone and call them. You can’t wait for a grieving person to want to call you, you need to call them. Be supportive; help them to make the best decisions even if they aren’t the “right” decisions. There isn’t a manual or a book out there that will describe every situation for you and how to handle it. Help yourself or help your friend, neighbor, family member to get through their rough time and the only thing you should want to get back is feeling good about yourself.